When Tilakam, from one of India's high social castes, married the love of her life in a simple ceremony 12 years ago, she feared outrage from relatives and ostracism. Tilakam's husband Kathir is a dalit -- once known as the "untouchables" -- who are at the bottom of India's deeply entrenched caste system and shunned by large sections of society. Their marriage is rare in a country where discrimination, violence and even death are known punishments for breaking strict social rules such as marrying into a lower caste. But what is even more unusual is the fact that their story has a happy ending. "We've not faced any trouble as my father was a really open-minded person... He took the courage to face our relatives' resistance," says Tilakam, who only wanted to give her first name. "We've been very happy," she tells AFP from her home in the southern city of Madurai. 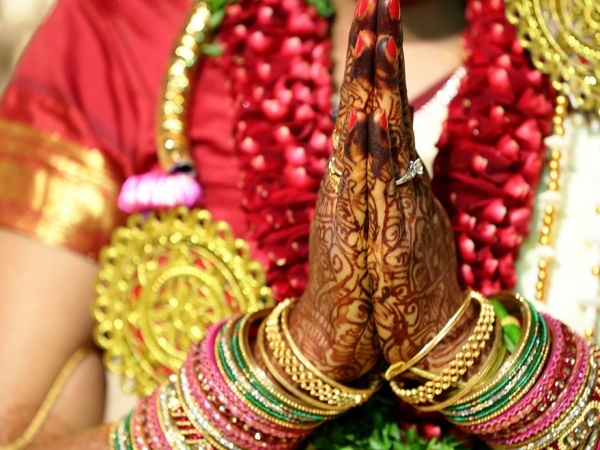 Indian law prevents discrimination against inter-caste marriage, but, in reality, many remain resistant to such unions in a country where, despite social change and rapid modernisation, tradition still holds sway. So-called "honour killings" in which couples are shot, stabbed, lynched or poisoned are still carried out, although in decreasing numbers, as families attempt to defend their reputation thought sullied by a breach of strict caste-based rules. Just two months ago, police found the charred remains of Sasikala, a 21-year-old high-caste woman, who had secretly married a Dalit in a temple in southern Tamil Nadu state, outraging her parents. The couple lived together for two years before fleeing their home, fearful of punishment from her parents, according to local media reports. Her parents found them anyway and by the time police arrived they were burning their daughter's body on a funeral pyre after reportedly making her consume a poisoned drink. Kathir, whose formal name is A.Vincent Raj, has formed a group to defend the rights of other Dalits to wed partners outside their caste and to work and live where they wish. Dalits, like other down-trodden groups, traditionally perform menial, dirty and often dangerous jobs as part of the hereditary system in place for generations. Traditionally poor, illiterate and landless, many still suffer discrimination despite government affirmative action policies and laws banning caste prejudice. "If an uppercaste man marries a lower-caste or Dalit woman, he's considered to have 'uplifted' her," Kathir says. But it is a different story when an upper-caste woman marries a Dalit man, he says. "The woman bears a lower-caste heir and that will be very difficult for the couple as opponents of their marriage will consider their caste is being made" 'impure' by the child's birth," he explains. Such prejudices mean such inter-caste marriages are few, although the numbers are growing, albeit slowly. Government figures show 9,623 marriages were recorded in 2012 between Dalits and partners from higher groups, compared to 7,617 the year before -- a small figure in a country of 1.2 billion people where getting married is considered paramount. Local newspapers are full of advertisements from parents seeking partners for their son or daughter from the same caste, and arranged marriages are still common. "Parents may agree with their child's choice (of partner)," Srinivas Goli, a professor at the Giri Institute of Development Studies in the northern city of Lucknow, tells AFP. "But the families' concerns about the reputation and respect for their families (by the community) often force them to go against" their child's choice in such cases, he says. Some families themselves fear marginalisation and even physical harm from the rest of the community, particularly in rural and remote areas, if they stand by their children's choices to break caste rules. In northern India, male-dominated khap panchayats or village committees wield huge influence in such matters and often act as a kind of moral police. In Haryana state, for example, where khap panchayats are dominant, Dalits are almost entirely landless. And Dalits marrying into higher castes threaten to "change the balance of power" that has been in place for generations, says Sangwan. "There's a threat of changing power equations which is intolerable for status-conscious sections of society who want to retain hegemony over economic and social resources," Sangwan tells AFP. There are no quick fixes to these centuries-old problems, says researcher Goli, but increasing "urbanization, education and employment of women" can "pave the way for an increase in inter-caste marriages." Sutapa, a 39-year-old researcher, and her husband met and fell in love at a university in Mumbai where they were pursuing their doctorates. Both are from different castes, although neither is a Dalit, and they speak different mother tongues. They were determined to stay together, and after three years, they finally convinced their parents to accept the relationship. "Living in a large city away from the village, you can more easily meet someone from another caste," says Sutapa, who did not want to give her full name. "We had to adjust to each other, but being university graduates helped us," she told AFP. Married now for 11 years, the couple have two boys, aged four and nine. And she says "my sons growing up will definitely know the meaning of a love marriage sometime."